Without wanting to make too bad a judgment on a different guitar, against the Reid Vaultback, a normal price industry guitar would seems as it were the handicraft of a ten-year old child. Extraordinary, unique, far away from any mainstream and artistically valuable. 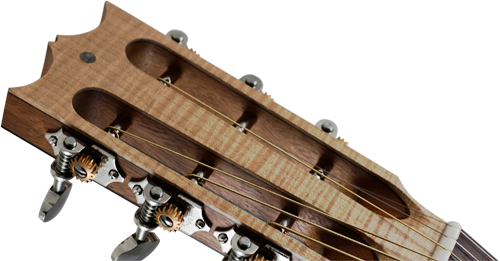 The Vaultback Halo of DAR is a masterpiece of contemporary lutherie – without ifs and buts. Its unbelievable value as a musical instrument competes with its artistic quality. I am honoured to have been allowed to play a guitar that differs so much from anything known and which leaves such an impression. Considering how rare these creations are, how innovative, refined and special, I want to predict that they will also play a prominent role in the future. After the quick sale of my last instrument I decided to make another - more decorated - similar model. This one has a slotted head, Indian rosewood back and ribs, Sitka Spruce top, Indian Rosewood fingerboard and bridge, Brazilian Mahogany neck, walnut and apple rosette, and steel Waverly tuners. I am going follow on with my last experimentation of making the body profile asymmetrical. I tried this years ago with a birds eye Maple model, now owned by Cliff Van Coevorden. Not everyone liked it aesthetically, but tonally I strongly believe it's the way forward! Along with the other methods I employ I find this blends in nicely. Another little touch I intend to feature on this model is a chamfered lower left hand bout, with another monitor on it as well. I want to do this mainly for comfort, but I believe, after having used monitors in my last two instrument, that this double monitor shall produce even more clarity for the player! If you'd like to check out the work in progress then drop me a line! FAQ: What Are Your RealWood Models? The Bare Knuckles are out!